Farrar, Straus and Giroux (BYR), 9780374384401, 32pp. 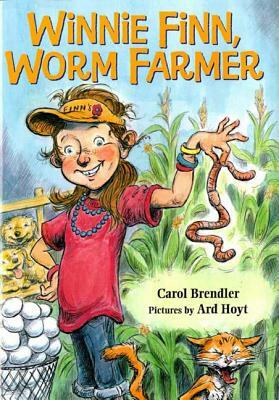 Winnie Finn is crazy about earthworms and knows everything about them. When spring arrives in Quincy County, all she can think about is the county fair coming up. This year, she would like nothing more than to win a prize for her worms so that she might buy a shiny new wagon for transporting them around. Trouble is, there's no prize at the fair for worms . . . Bright, energetic illustrations accompany this jaunty tale about a young girl's creativity that will inspire readers of all interests— but especially those with a love for something wiggly. CAROL BRENDLER holds a master’s degree in writing for children and young adults from the Vermont College of Fine Arts. She lives in Ottawa, Canada. She is the author of Winnie Finn, Worm Farmer and Not Very Scary. ARD HOYT has illustrated several picture books, including the best-selling I'm a Manatee by John Lithgow and Saying Goodbye to Lulu, an ASPCA Henry Bergh Children’s Book Award winner by Corinne Demas. He lives in Bentonville, Arkansas.